The Housing Authority adopted the 2019 Annual Plan at the April 10th 2019 Board Meeting. A copy of the final 2019 Annual Plan can be found in the Annual Reports section of this website. 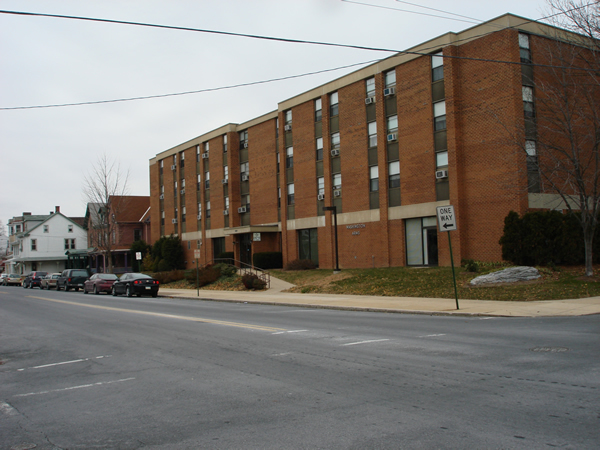 The Lebanon County Redevelopment Authority and the Lebanon County Housing Authority Boards will meet on the following dates: January 9th, February 13th, March 13th, April 10th, May 8th, June 26th, July - No Meeting, August - No Meeting, September 11th, October 9th, November 13th, and December No Meeting. Meetings are held at 1220 Mifflin Street, Lebanon, PA 17046. The Redevelopment meeting begins at 3:00 PM with the Housing Authority meeting following at approximately 3:30 PM. The Lebanon County Redevelopment Authority has made the Lebanon County Stormwater Consortium's Regional Joint Pollutant Reduction Plan available through an external link because of the file size. Please click here to download the 341MB PDF file. The Governing Body of the Lebanon County Stormwater Consortium will hold its regular monthly meetings on the third Tuesday of each month (with the exception of April) at 10am at 1220 Mifflin Street, Lebanon, PA 17046. The dates are as follows: January 15, February 19, March 19, April 23, May 21, June 18, July 16, August 20, September 17, October 15, November 19, December 17. These meetings are accessible to persons with disabilities. If special accommodations are needed, please call 717-273-9326. Minutes and agendas for the Governing Body meetings can be found under 'other documents' on the 'Document Library' page of this website, linked here and on the left hand column. The following are the regular monthly meeting dates for the City of Lebanon Land Bank for the year 2019. January 9, February 13, March 13, April 10, May 8, June 26, July 10, August 14, September 11, October 9, November 13, December 4. The Land Bank meetings begin at 1:30pm with the exception of the December meeting, which begins at 3pm. All meetings will be held at 1220 Mifflin Street, Lebanon, PA 17046. These meetings are accessible to persons with disabilities. If special accommodations are needed, please call 717-273-9326. The most recent drawing was held on November 27, 2018. A list of the application numbers selected in recent drawings can be found in the Section 8 Lottery section of this site. The Housing and Redevelopment Authorities of the County of Lebanon are currently requesting quotations for Workers Compensation and Employers Liability Coverage. Information and specifications are available for download on the Bid Information section of this site. Quotations are due no later than May 1, 2019. The Housing and Redevelopment Authorities of the County of Lebanon request proposals from Certified Public Accountants for the annual audits of project accounts for the year end 2019 with the option to extend 4 additional years. Information, specifications, and proposal forms are available for download on the Bid Information section of this site. Sealed bids are due by 2pm on June 5, 2019. The Redevelopment Authority of the County of Lebanon is accepting bids for the reconstruction of East and West Chestnut Street in Jonestown Borough until 2:00pm prevailing time on the 14th of May at the Authority's office at 39 N 12th Street, Lebanon, PA 17046. Bids will be publicly opened and read aloud at that time. Bidding and contract documents may be downloaded via the Bid Information section of this site. Bids for the paving of East Old Cumberland Street in North and South Lebanon Townships and for the demolition of 1405 E Old Cumberland Street in North Lebanon Township, Lebanon County, Construction Contracts Numbers C-2-19-NSLT and D-2-19-NLT, respectively, were opened on March 7th. The tabulation of bids is available for download on the Bid Information section of this site. Bids for the rehabilitation of 3 Folmer Street in South Lebanon Township were opened on February 5th. The tabulation of bids is available for download on the Bid Information section of this site. Bids for this project were opened on September 6th. Bid results can be found in the Bid Information section of this site.